As much as I love sharing my own thoughts and images with you here, there's something so sweetly uplifting about sharing the photographs of my students, and it's that sweet time again! I'm delighted to present the absolutely beautiful work of my nature photography students from the April 2016 session of How to Take Better Photos of Nature and the World Around You. Although I couldn't include everybody's work (just too many beauties--a good problem to have! ), I chose the shots that most represented what the course is all about. Please note that every single one of these photographers is an amateur. (I feel like I always need to point that out because the students' work is so darn good!) Enjoy, enjoy, enjoy...! Believe it or not, you can create beautiful photos at this high level, too. Why not gift yourself (or somebody you love) with the opportunity to learn how to take spectacular pictures of nature and the world around you? Learn how to capture this season--and every season--in its full glory. You don't need a fancy camera. (You can even use your phone's camera). You don't need to be "in class" at a certain time. There's nothing you need to buy. There's no pressure to do assignments. Just go at your own pace, make some new friends from near and far, and enjoy the process of learning how to take AMAZING photos! The next session of this course will run from Monday, October 17 through Friday, November 4, 2016, and I'd LOVE for you to be a part of it! Spaces are limited, so please don't wait until the last minute to register if this class is calling out your name. For all of the nitty-gritty course details, just click here. Any other questions? Just drop me a note at JoyfullyGreen.com@gmail.com. Hope to see you "in class" on October 17th! A very grateful "thank you" to all of my April students who allowed me to share their lovely work in this post. © 2016 by Joy Sussman/JoyfullyGreen.com LLC. Photographs within this post are the artistic property of the students as noted; they own the copyrights and all rights are reserved. Site licensed by Creative Commons. Yesterday I woke up to the sound of a woodpecker, which (if I'm being honest) wasn't very pleasant. But it's hard to resist such a rare photo opportunity, so off I went to the chilly back yard (25 degrees in April! ), right to the edge of the woods, to study this noisy but industrious fellow up-close. It's both easy and not easy to get a good picture of a woodpecker. It's not easy because they don't stay still for you--they have their own agenda, and that agenda is knocking their beaks into a tree trunk repeatedly and with great gusto, scoping out the insects that are hiding inside. But it's easy if you can get into their rhythm. Peck-peck-peck-peck-peck...(pause)...peck-peck-peck-peck-peck (pause). It was at the pauses that I clicked the shutter button. "How nice of him to stop and pose for you," said a friend on Facebook when she saw the photo above. I assured her that he didn't stop; it was just a matter of working with his rhythm. I also learned the distance that was "too close for comfort" for this particular bird. I'd take a few snapshots, then inch closer...more shots, more steps silently forward (well, as silent as the still-crunchy fallen leaves would allow). When I got within about 10 feet, the woodpecker skirted around to the other side of the tree trunk, "hiding." If I edged closer still, off it flew to a nearby tree, where it would complain loudly to me for getting too close. We spent nearly an hour together, off and on. My fingers would go numb (even through my gloves) and I'd go inside to thaw out and change lenses. During one of these thawing breaks, I learned from one of our bird guidebooks that I was photographing a Pileated Woodpecker. It was a male because it had that red "mustache" at its bill. The guidebook told me it was a relatively shy bird, but I'm not sure I agreed. After all, we'd come to an understanding: Keep my distance and we could "hang out" together. I gave up first, though. It was just so very cold, I had already taken many pictures, and he was doing the same thing over and over, in his own zone. Much later in the day, after the kids got home from school, the same woodpecker was back at the same tree, pecking another large oval hole. My eight-year-old daughter ventured out to the edge of the woods with her own camera, watching and learning the rhythm of the bird. Last call: Sign up for my online nature photography course that starts this Monday, April 11, 2016. (No fancy camera necessary--you can even use your smart phone!) Click here for all the details. That's my favorite quote lately, and it certainly came to mind as I was putting together the latest gallery of my students' work, this one from the October 2015 session of my online course "How to Take Better Photos of Nature and the World Around You." During our weeks together, all of these students (now friends) reminded me to seek out the new, the unexplored, the everyday extraordinary. 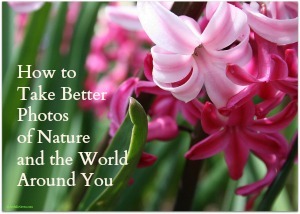 I'm so proud of these amateur photographers (yes, amateurs--can you believe it?!) who take pictures for the mere joy of taking them, celebrating daily life with their lenses. It's always hard for me to narrow down the shots that I share with you here, but I hope you'll enjoy this collection of images as much as I do. Let's ring in spring (or fall, if you're Down Under) with our cameras! A very grateful "thank you" to all of my students who allowed me to share their lovely work in this post. LOVED this: You Know What Will Ruin My Kids? Multi-tasking is killing your dreams. Especially for my creative friends: Too many people already do what I want to do. Is this the (adorable) reason you can't find a matching pair of socks? Retirees dump their possessions and hit the road. Just two more weeks to register for the next session of my online photography course, How to Take Better Photos of Nature and the World Around You, and the Early Bird discount of $10 off ends 9/25/15 (midnight EST). Join me in October to create some beautiful pictures of your own! Click here for details and registration.